Client injury from pinching skin with belt or from fall from lifter or lifter malfunction. Cross infection to client from lifter belt. 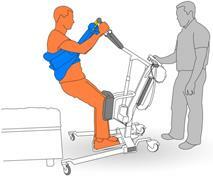 Muscular soft-tissue or skeletal injury to workers from incorrect movement or posture. b. Use a minimum of 2 workers for the task. c. Do not use if client cannot weight bear. d. Check there is enough space to move portable hoist at every step of task, remove any tripping hazards. e. Always move in same direction as hoist when walking it; do not twist. f. Communicate with client and other workers at every step of this task. Make sure you know how to operate all controls of the specific Stand Lifter. If unsure, review Standard Operating Procedure (SOP) for this Stand Lifter. Report immediately if SOP not available. Check the battery for the stand lifter is charged and in good condition. If any faults, report immediately and do not use. Check the lifter (hooks, wheels) and lifter belt for signs of wear or damage. If any faults, report immediately and do not use. Prepare hoist and lifter belt. 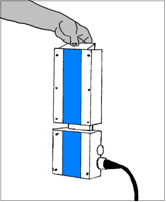 Take battery out of charger and insert into portable hoist. Get lifter belt, making sure it is the correct one for the task. 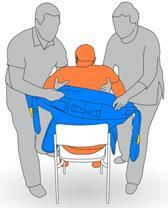 Place lifter belt around lower back of client. Prepare client by getting them to sit on edge of chair or bed. If client needs assistance, do so by repositioning them to edge of chair or bed. Workers lean client forwards, put belt around the client's upper waist. Firmly secure belt in place. Bring lifter forward, place client's feet on foot plate. One worker to place client's feet on foot plate by lifting each leg at knee. Other worker to keep lifter steady, then move it closer. Position the lifter and attach strap loops. Bring lifter forward so client's knees are secure against the knee pad. Re-apply brakes. 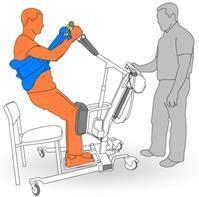 Place client's hands on lifter arms and prepare for lift. 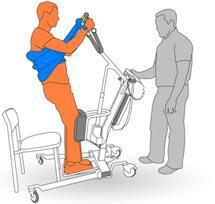 Place client's hands on the lifter arms, with their arms over and outside the lifter straps. Explain to client that lifter is about to be activated. Raise client to standing position. First worker raises client to standing position using lifter controls, watching that loops are in place. Second worker watches and reassures client, encouraging client to assist stand if possible. 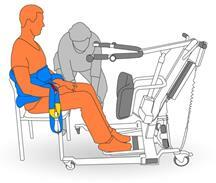 If client looks uncomfortable or unbalanced, lower lifter and reposition. Move client with stand lifter. 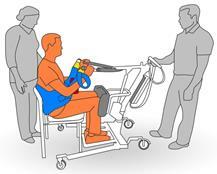 Ensure area is free of hazards when client is in standing position, move hoist as required. Second worker assists to guide client as needed. First worker to use handles on lifter to slowly push to new location, move with direction of hoist. Do not twist. Again, make sure area free of hazards. Lower client with stand lifter. Operator brings lifter into position. 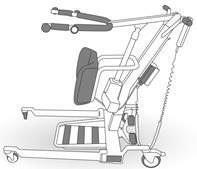 Using lifter controls, first worker lowers client onto bed or commode. Second worker gets into position to the side of the client, making sure client is lowered safely. Release loops and remove stand lifter. Make sure client is safe before removing equipment. Unhook loops of belt when it is relaxed. Lift client's feet off foot plate, remove stand lifter. Make sure client is comfortable. Put lifter away, place battery back in charger as required. Place all other equipment in correct storage areas.